The Monastery and church have a turbulent past: first it was destroyed during the 1667 earthquake, later, in 1806 it has been robbed by Russians and Montenegrins ; from 1807 to 1825 it is used (rented) by occupiers as a storage. Since 1839 the monastery housed a health department, a customs office, a post office and the port authority. In 1958 it was home to the builders of the Racic family mausoleum. Finally, since 1984. the church and monastery are listed as a monument. Valuable works of art can be seen at the main altar. 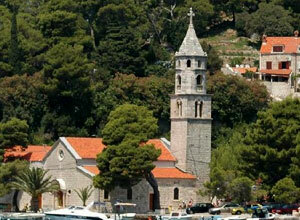 They represent the small steep streets of Cavtat,summer houses and gardens at the waterfront. In the 20th century, Vaho Bukovac painted a panorama of Cavtat in the lunette between the church aisle and apse. The most valuable work of art is the polyptych of St. Micahel dating back to 1510.